Writing in the journal Science, they say it would be theoretically possible for these changes to occur in nature.Researchers have identified five genetic changes that could allow the virus to start a deadly pandemic. Avian influenza is flu infection in birds. The virus that causes the bird infectin can change (mutate) to infect humans. Such mutation could start a deadly worldwide epidemic. 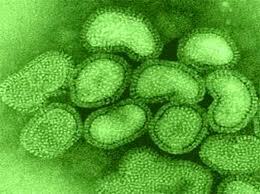 The first avian influenza virus to infect humans occurred in Hong Kong in 1997. The epidemic was linked to chickens and classified as avian influenza A (H5N1). Human cases of avian influenza A (H5N1) have since been reported in Asia, Africa, Europe, Indonesia, Vietnman, the Pacific, and the near East. Hundreds of people have become sick with this virus. Slightly more than 60% of those who became ill have died.